Tom Cruise gets some cred for the recent publicity surge regarding his stunts in the latest MI5. Hanging off a flying plane does take some guts, as well as a high speed car and motorcycle chases. Not to mention the various fisticuffs with nameless bad guys. 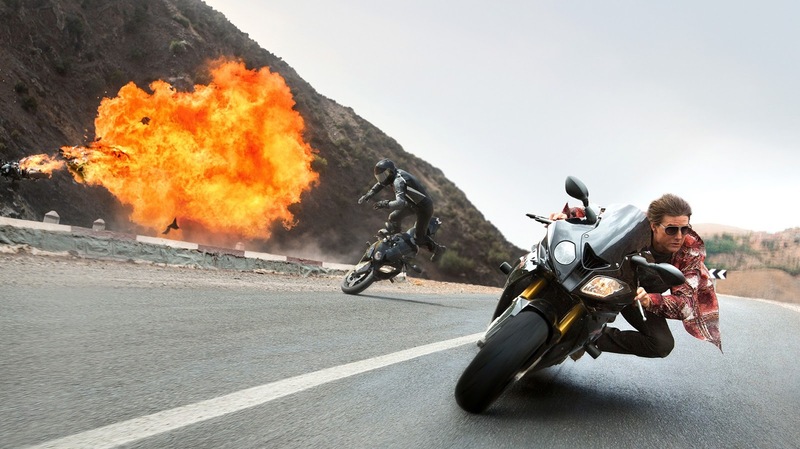 Director/writer Christopher McQuarrie (Jack Reacher) starts this adventure shortly after the events in MI4. If you can't remember, it's no big thing. The last one made big bucks, but because this film is better. Ethan Hunt (Cruise) is after “The Syndicate” who are a shadow group creating what seems to be accidents involving major world figures. It's members turn out to be various bad guys who are supposed to be dead. Everyone thinks that Ethan is delusional and CIA head Hunley (Alec Baldwin) wants the Mission Impossible team disbanded. Especially the mess they made in Russia in the last adventure. The remaining IMF members will be now under the CIA. Benji (Simon Pegg) the computer geek is sent to a desk and has to take psych tests that he's not helping Ethan. Luther (Ving Rhames) quit so he's not working for the CIA. Brandt (Jeremy Renner) works closely with Hunley trying to get him to let up on Hunt. Meanwhile Hunt is captured by what may be the syndicate being set up to be tortured by Ilsa (Rebecca Ferguson) who for some reason helps him escape from certain death. But she may be working for them...or is she? While Hunley is trying to track Hunt, Hunt sends a message to Benji to go to an opera in Vienna. There they uncover a plot to kill the Bavarian Prime Minister with three shooters involved including Ilsa. Once more she helps him escape from the glowering bad guys with her impressive fighting skills. She is like a female Ethan Hunt. Luther and Brandt try to get to Hunt before Hunley's team finds him, so they track Ilsa. There are lots of twists and turns, backstabbing, spycraft, some cool gadgets and those facemasks. The who what where and why they are doing this doesn't seem to be all that important, it's just the action sequences and that are basically why these movies remain as popular as they have been. There are lots of international locations in this film as usual. Belarus, Vienna, Casablanca and London. The concept of the Rogue Nation is a bit of a red herring. The sleight of hand of who is working for who, is all nicely and neatly packaged for the last minute reveal. Simon Pegg steals the show most of the time and rightly so. Cruise is looking a little aged around the edges at the age of 53, the shelf life of his character is creeping up. He still seems fairly agile and game so another film of the series is already in the works for next year.